Republican gubernatorial candidate Cynthia Coffman, who’s also Colorado’s attorney general, spent a substantial chunk of time during her early career helping Colorado Republicans develop legal arguments to defund Planned Parenthood. She became widely known as an expert on the arcane topic, and last year, anti-abortion activists repeatedly cited Coffman’s 2001 legal opinion as evidence in a lawsuit (footnote 3 here) claiming that Colorado’s ban on using tax dollars for abortion precludes the state from funding Planned Parenthood at all, even for the women’s health organization’s non-abortion services for low income people, such as breast cancer screening. Colorado’s Supreme Court disagreed, ruling last month that the state can provide funds for Planned Parenthood’s non-abortion services, despite the constitutional abortion-funding ban. Coffman’s campaign did not respond to my request for comment after the Colorado Supreme Court decision last month. But during a brief interview Wednesday, prior to a debate, Coffman indicated that her hard stance against Planned Parenthood may have softened. If Coffman were still opposed to funding for Planned Parenthood, a quick “yes” would have ended my interview. You wouldn’t think a “longer conversation” would be required to restate an existing and painstakingly well-documented view. Still, it’s quite possible her hard line position hasn’t changed, and she just wanted to lay it out during a long conversation. So we don’t know for sure. At Wednesday’s debate, she referred me to a staffer, who was accompanying her. The staffer asked me to email her my interview request, which I did and to which I’ve gotten no response. Coffman has taken conflicting stances on the abortion issue during this year’s gubernatorial campaign, accepting a TV reporter’s characterization of her as “pro-choice” but later telling a talk show host she refuses to accept the “pro-choice” label. Then she told another reporter she wants abortion to be “rare” and “safe,” which sounds more like a pro-choice stand. Against this backdrop, you can see why Coffman would rather not talk about the Planned Parenthood court decision, which is precisely why reporters should ask her about it! She’s already being pounded by anti-abortion conservatives for her contradictory statements on abortion during the gubernatorial campaign. And anti-abortion Republicans are known to have an outsized influence at GOP assembly, where Coffman must win 30 percent of delegates to advance to the primary election. So, she’d rather not say anything more to turn anti-choice activists away than she already has. At the same time, Coffman appears to be setting herself up to try to leapfrog over anti-abortion Republicans and appeal to pro-choice unaffiliated voters in the primary and general elections. For now, she apparently thinks her best strategy is to have it both ways on abortion, and talking about Planned Parenthood won’t help her. The Colorado Independent took a step yesterday toward winning its battle for the release of court documents illuminating why prosecutors messed up a death-penalty case in suburban Denver against Sir Mario Owens, who was found guilty in 2005 of killing two people. Arapahoe-County-area prosecutors George Brauchler and his predecessor Carol Chambers wrongfully withheld evidence that might have helped Owens’ defense, according to a Colorado court ruling. But the documents explaining the screw-up were sealed. The Independent asked a court to unseal the records, but a judge said no, arguing that Owens would have been found guilty anyway, even if his defense had been given access to the records. Yesterday, the Colorado Supreme Court asked the judge to explain his legal reasoning for keeping the records sealed. But here’s the interesting part, from a political perspective. Not only are the prosecutorial-misconduct documents themselves sealed but so are documents from Brauchler’s office, filed in response to the Independent’s lawsuit, outlining his office’s arguments for keeping the documents sealed. In other words, Brauchler’s office admits that he doesn’t want them released for political reasons. So it’s no surprise that Brauchler, a Republican who dropped out of the race to be governor last year to pursue the attorney-general office, isn’t talking about why he wants to keep them sealed. Undoubtedly, Brauchler, who’s known for being readily available to talk to reporters and others, may have legal reasons for keeping the Owens’ documents sealed. But it looks as if politics is playing a big role, if you believe his deputy. But who knows without seeing the docs? At the end of the day, beyond one election, that’s what really matters here. During a KNUS radio interview Saturday, Colorado Attorney General Cynthia Coffman implied that ColoradoPolitics reporter Joey Bunch is writing unflattering articles about her gubernatorial campaign at the behest of Republican mega-donor Phil Anschutz, who owns ColoradoPolitics and the Colorado Springs Gazette through Clarity Media. KNUS 710-AM HOST CRAIG SILVERMAN: [at 12 minutes] I don’t know if your ears were burning last night, but on “Colorado Inside Out”, Joey Bunch — veteran political reporter — said, “What’s up with Cynthia Coffman? She doesn’t really have a campaign.” I know you have a website now. But, do you have a full- blown campaign? Do you have a campaign manager? Are you ready to really participate in this race? COFFMAN: You know, I’m going to say, “Baloney!” to Joey. Joey Bunch works for the Colorado Springs Gazette, owned by Phil Anschutz, who has already put out an editorial saying everyone in the Republican primary field should just clear the way for [Colorado Treasurer] Walker Stapleton, because that’s who [Anschutz] supports. So, I think you need to consider the source. Yes, I have a campaign. As I told you, I won Attorney General statewide by a higher percentage than anyone else. I know how to run a statewide campaign and I think people need to stop worrying about the girl in the race. And, in fact (again), Bunch has posted multiple articles that raise questions about Coffman’s campaign (e.g., here, here, here, and here). ColoradoPolitics reporter Ernest Luning has written one as well. But unfortunately, those three facts don’t come close to proving that Anschutz is dispatching Bunch to attack Coffman in hopes of promoting Stapleton. Coffman’s implied accusation is the kind that’s heard when a journalist is reporting information that a candidate doesn’t want to hear. And in this case, Coffman hasn’t responded to Bunch’s specific points, made by other political observers as well, about lack of money, momentum, or campaign operations. So the evidence-free implication about Bunch being in Anschutz’s tank serves as little more than the ultimate insult for a professional journalist. BUNCH: “I’ve said worse about her. I’m flattered she cared enough to mention me by name. I can live without positive attention. Maybe I’m wrong, Maybe she actually does have a campaign. Man, what a world, a conservative criticizing me because I work for Anschutz. 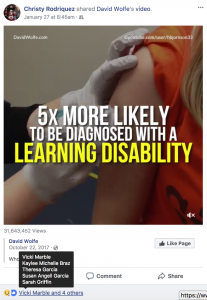 I thought the liberals were supposed to do that. Coffman’s office did not respond to my request for evidence that Anschutz is directing Bunch’s reporting. As Bunch points out, you’d expect to see the red flags about Republican donor Anschutz and ColoradoPolitics being waved by progressives. My response to them is, I trust the journalists at the Anschutz-owned outlet to let us know if the owner’s fist pounds the table and demands bias. They’d know, and I think at least some of them would tell us what’s going on. 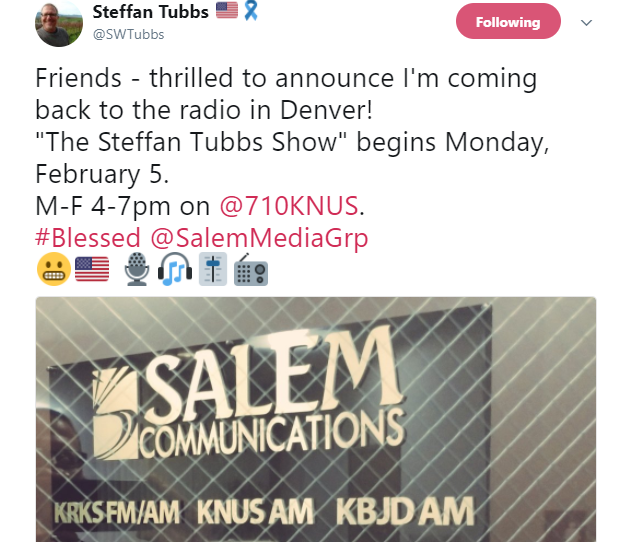 Now Tubbs is jumping over to conservative KNUS radio, joining a lineup of ultra-conservative local yappers. The local part I like; the monolithic conservatism is ugly and getting uglier in the age of Trump. So I was glad to see that KNUS was adding Tubbs, who I thought was less of a predictable conservative than other KNUS hosts. Tubbs often asked decent questions of his guests on his KOA show, and I admired his book about an African-American serviceman. But it looks like Tubbs is a moderate no longer, if he ever was one. Judging from a KNUS guest appearance Jan. 19, it looks like his departure from KOA has sent his right wing flapping. “If you’re just tuning in, and you wonder who I am, I consider myself very, very middle-of-the-road. I consider myself to be a reformed Democrat. When I was younger, let the government help, and all this sort of thing. Wishing Hillary were locked up. Voting for Trump. Moderate? I tried repeatedly to reach Tubbs to discuss this, but alas he did not respond to me. In response to my first attempt to contact him last week, he asked for my email address. But radio silence ever since. Oh well. 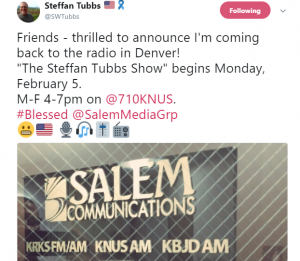 Tubbs will be taking the KNUS slot currently occupied by social-conservative lawyer Dan Caplis, who announced Jan. 18, that he was going to take “a little sabbatical” from the regular radio show to spend more time with his family and write the definitive book on the “Colorado disaster” with marijuana. He said he plans to return to radio work after his daughter goes to college. I’m hoping Tubbs won’t turn into another Caplis on the ideology scale. But it’s not looking good. Listen to Staffan Tubbs say he’s a moderate despite voting for Trump and saying Clinton should be in jail. You are currently browsing the The Big Media Blog weblog archives for February, 2018.